Luxury travelers are trophy hunters. They like to get to a vacation destination before everyone else does -- but in comfort and in style, and with good value, too. Here are 2016's hot destinations for thrills, chills, nice hotels, and modest prices. If you dream of a Southeast Asian beach resort without crowds and high prices, we have a place for you. 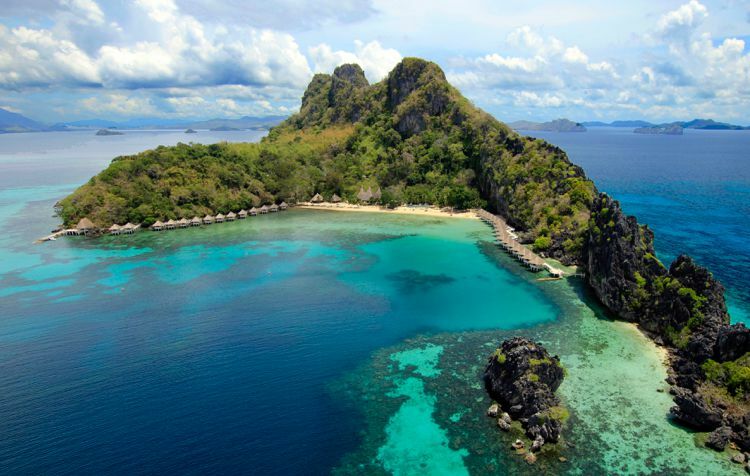 It's in the Philippines: Palawan province, a natural paradise blissfully removed from the modern world. You'll never feel hemmed-in or pressured in Palawan. It offers privacy: nearly 1800 islands with 1200 miles of virgin coastline. The typical Palawan landscape is out of a storybook: a jungle-covered small isle topped by an extinct volcano, bordered by serene sugar-sand beaches, and lapped by jade-green waters. Palawan is a natural paradise (and UNESCO World Heritage Site). Its impenetrable limestone cliffs and vast stretches of wildlife preserves protect creatures of the land, sea, and air. This province is one of Planet Earth's best spots for diving and snorkeling. • Coron Island's shipwreck diving is renowned...do you dare? Upscale visitors head to several distinctive destinations in Palawan. If this picture of Valparaiso reminds you of San Francisco, well, the two cities have a lot in common. How Valparaiso Differs from San Francisco: It's Cheap to Visit! Unlike San Francisco, Valparaiso is a travel bargain. Even staying in a luxury hotel, you won't spend a lot here. The attitude in Valparaiso is "we are cool and we know it!" This town has all the hallmarks of a happening travel destination. Cerro Concepción (Conception Hill) is not to be missed. Between Christmas and New Year's, Valparaiso hosts a major festival. • And let's not forget: this is the height of summer in the Southern Hemisphere! For a long time, luxury travel to D.R. consisted of the great golf resort Casa de Campo. The island's other hotels were mainly midscale all-inclusive resorts on the eastern coast. But D.R. has exploded with luxury offerings -- that are still more moderately priced than other Caribbean islands. Americans who love vacationing in Mexico often have safety concerns about visiting less-touristy regions and towns, especially those near the U.S. border. But the city of Mérida, the capital of the culturally Mayan state of Yucatan, is in the quiet extreme south of Mexico. And this colonial gem is becoming a fashionable destination that conserves its colonial beauty, charm, serenity, and travel-bargain tabs. Mérida has become a top choice in Mexico for Americans seeking second or retirement homes, like Puerto Vallarta and San Miguel de Allende. What Does Mérida Offer Visitors? • Beautiful colonial churches, palaces, and monuments, earning Mérida the nickname "the White City"
In Mérida, you'll find familiar large hotels like the Grand Hyatt, Fiesta Americana, and Presidente InterContinental. But Mérida's authentic hotel style is elegant boutique hotels that were once family mansions. Mexico's Riviera Maya vacation region is Cancun's sleepier sister just to the south. It has become a top destination thanks to its endless, exquisite Caribbean beach and its mainly all-inclusive resorts lining the shore. A few tiny villages and one small city -- Playa del Carmen -- dot the Riviera Maya. Until recently, Playa del Carmen was a place to catch the ferry to your hotel on the island of Cozumel, or if you were bored with your resort and wanted to check out Playa del Carmen's tequila-soaked atmosphere. Playa del Carmen is now a place to stay and enjoy a beach vacation with city sophistication, dining, and clubbing. No longer is Playa del Carmen's main street, "La Quinta," a jungle of honky-tonk shops and raucous bars. La Quinta is now a place where you can shop by day for fine fashions and Mexican silver jewelry, and dine, drink, and stroll in style by night. In the past few years, a number of boutique hotels have opened to cater to a young demographic. In the past couple of years, several luxury hotels have opened for business right in Playa del Carmen. LAT20 Hotel by Live Aqua is a fashionable, all-inclusive hotel for adults only. Grand Hyatt Playa del Carmen has a privileged and rare location right on the beach. Northern Portugal's magnificent Douro River Valley has been a destination for eons--from Neanderthal times onwards. The Douro Valley's timeless beauty works its magic on everyone. The Douro river valley is a darling of the river-cruise world. The Douro Valley is Europe's oldest wine region, and a new generation of wine lovers is discovering its native red and white varietals. As evidenced by the photo above, the city of Porto is a sight to behold. It is set on steep hills bounding the Douro River, and the best way to explore Porto is on foot...over several wine-intensive days. Gozo sounds exotic...and it is. It's one of the three islands that compose the tiny nation of Malta. What Is There to See and Do on Gozo? For such a tiny place, Gozo has an amazing array of places to see. You could spend an unforgettable week here. Where Do You Stay on Gozo? Visitors to Gozo have their choice of accommodations. Hollywood's reigning couple (and their kids and assistants) stayed for months on Gozo, the location for their 2015 movie, By the Sea. Many Gozo visitors take a 45-minute ferry ride from the main island of Malta, which offers full-service hotels. The top place to stay on Malta is Corinthia Hotel St George's Bay, which is both elegant and lively. Many Israel visitors make ancient Jerusalem their destination in the Holy Land. But modern Tel Aviv provides a thrilling contrast. You haven't fully experienced Israel unless you've immersed yourself in thriving Tel Aviv for a few nights. This Mediterranean city is a hotbed of sophisticated lifestyle. It may remind you of other palm-tree-lined cities. And then you will realize: Tel Aviv is an original. One of the tourism joys of Tel Aviv is its array of fashionable hotels -- at lower rates than luxury hotels elsewhere. Some visitors choose to stay in a traditional luxury hotel. Find Out More About "TLV"
Abu Dhabi perches on the calm Persian Gulf 90 miles down the coast from Dubai. They are both part of the United Arab Emirates and share a prosperous, modern Arab perspective. Abu Dhabi has a beautiful setting: it's a verdant port beside the timeless Arabian desert. Abu Dhabi has earned a reputation as the Emirates capital of arts. Now, cultural travelers are looking toward Abu Dhabi and counting the days. Everything about the Louvre Abu Dhabi, from its domed design by French "starchitect" Jean Novel to its spectacular paintings and antiquities, promises that Abu Dhabi is poised to become a world capital of precious art. Saadiyat Island is a cultural treasure trove created for sophisticates. Abu Dhabi is a vibrant city with amazing architecture, sophisticated dining, championship sports, and spectacular hotels. Visitors to Abu Dhabi can enjoy traditional, multi-course Arab feasts, often served under the sun or stars. And Intrepid diners can explore Abu Dhabi's celebrity-chef shrines. Sri Lankan cuisine is unique. Its primary influence is Indian, but you will also taste the flavors of the Middles East and Malaysia, and notice the serving styles of Holland and England. So what's the hot Southern destination now? Charleston, South Carolina? Asheville, North Carolina? Savannah, Georgia? I admit it: we're not the only ones who suddenly have a huge crush on RVA: Richmond, Virginia. Travel + Leisure named it #3 of ts 50 top destinations for 2016. What Makes Richmond So Hot? This is Richmond's moment. It's still a charming, small Southern city with just over 200,000 residents...but with the style and cultural offerings of cities 10 times its size. If you like Vegas but feel it's gotten too glitzy, pricey, and crowded, Reno is the Nevada casino destination for you. It's a real Western town that later became a gambling magnet. What's There to Do in Reno Besides Gamble? Reno is the city nearest Burning Man, and the place where festival revelers like to meet before or after. • If this doesn't say "trendy," what does? What Should You Do if You're Not Enjoying Travel? Is Train Travel Right For You?